I love drawing faces and seeing how I can combine these with atmospheric, miniature worlds. 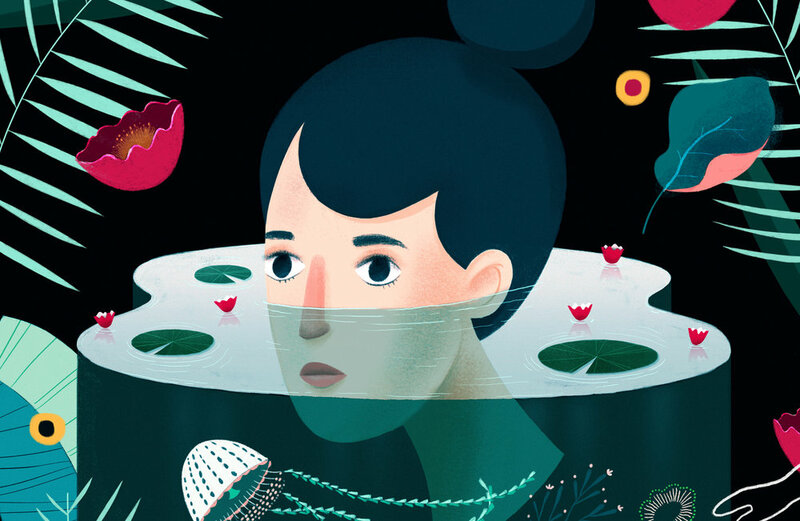 In this one she's floating in a body of water, surrounded by sea creatures. I develop conceptual based illustration for my own line of paper goods, advertising campaigns, storybooks and one off commissions for clients around the globe. I love drawing people and incorporating rich and vibrant colour palettes into my work. You'll often see me doodling faces or making patterns and combining these with an abundance of plants and foliage. Hey! My name is Arnelle Woker. I am an illustrator and designer from South Africa. I'm currently living in lovely London town. Tell us a fun fact about you. I like eating raw bacon! How did you get into illustration? In a round about way actually. As a kid I would always be drawing and the subject matter ranged from ninja turtles and micro machines to princesses, mermaids and my little pony. After school, I started studying Occupational Therapy but soon realised I seriously missed being creative. So I changed course and started studying Design. After graduating, I worked in broadcast, advertising, publishing, production and animation. It’s only over the past few years that I've seriously pursued illustration. I think it forms part of you and I really do love what I do! What tools (digital or not!) do you use to create your work? I work mainly in Adobe Photoshop, Illustrator and Procreate. I also like carrying a journal on me at all times to doodle or jot down ideas. I make epic lists that never end! Who or what inspires you the most? Nature and the great outdoors. Travelling and experiencing other cultures. Not to mention all the crazy talented people I follow on Instagram. So much talent out there! What would your dream project be? To expand on my existing range of patterns and combining that with fabric and textiles. I'd love to get my hand in on designing store windows and interiors too!